Examine a Briarheart for Neloth. Neloth wants to know the secret. Find a Briarheart of the Forsworn. 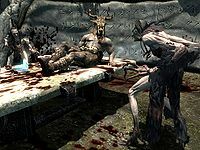 When you ask Neloth if you can help him with his research, he may respond: "I've been having difficulties with my heart stone experiments. Have you heard of the Briarhearts? They are fierce warriors of the Forsworn tribes. They actually remove their own hearts, and replace them with large briar seeds. It puts their lifesparks in direct connection to the natural forces. I need you to examine one of them. Just investigate as much as you can. I'm going to put this memory trace spell on you, so you won't have to worry about taking notes. I doubt you could know what was important anyway." He then reveals that he has been experimenting with similar theories but all his test subjects died in the process. Lastly, he will point you towards Skyrim and The Reach to find a specimen in a Forsworn hideout. Before you leave, he will cast Neloth's Memory Spell so you can remember what you observe. You will have to travel all the way back to Skyrim, so hire the boat in Raven Rock or simply fast travel to Windhelm. Then go west to the Reach, where hold capital Markarth has its fair share of problems with the Forsworn. They can be found in most locations where the Forsworn have set up camp, such as Lost Valley Redoubt, Broken Tower Redoubt, or Hag Rock Redoubt. After you have killed a Forsworn Briarheart you will be given two options, either "Harvest" or "Search". Choose "Harvest" and the quest will update and tell you to return to Neloth on Solstheim. Back in Tel Mithryn, a trio of ash spawn will be waiting outside to attack upon your return. Inside his tower, Neloth will be awaiting your arrival. When you tell him you examined the Briarheart warrior, he will comment: "Oh have you? Well, let me just extract those memories and I'll see if you found anything useful. I promise that any unrelated memories I run across will be kept in the strictest of confidences. Here, you deserve a bit of reward for your efforts... that was a lengthy trip for you, I'm sure!" He will then hand you 250 gold for all your hard work and the time you spent traveling back and forth. Pickpocketing a Forsworn Briarheart for its briar heart will not give you the option to "Harvest" when trying to loot its body. You must kill it in another way. 100 Neloth has asked me to examine a Briarheart warrior of the Forsworn tribes. He couldn't direct me to a specific one, but he said they live in the hills on the western edge of Skyrim. 200 Neloth has asked me to examine a Briarheart warrior of the Forsworn tribes. I found one and saw how the heart was implanted. On the PC, it is possible to use the console to advance through the quest by entering setstage DLC2TTR5 stage, where stage is the number of the stage you wish to complete. It is not possible to un-complete (i.e. go back) quest stages, but it is possible to clear all stages of the quest using resetquest DLC2TTR5. This page was last modified on 1 January 2018, at 05:55.